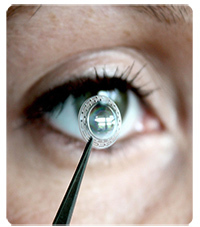 Florida Lions Eye Bank is proud to offer eye donation for research as an end-of-life option. Since 1962, thousands upon thousands of selfless individuals have donated their eyes for research, benefiting countless others for generations to come. Florida Lions Eye Bank provides this donated eye tissue at no cost to ophthalmic researchers in our community who work tirelessly to restore the beauty of sight. Who donates eyes for research? Some people who wish to become eye donors are too old at their time of death for their corneas to be used for transplant. Often, these individuals are still eligible to donate their eyes for research purposes. In fact, most people who donate their eyes for research to Florida Lions Eye Bank are registered donors over the age of 70 years. There is no upper age limit to donate eyes for research. Occasionally, eye tissue intended for transplant cannot be used due to medical or regulatory reasons. In these instances, the tissue is still valuable for research. Why donate eyes for research? Eyes donated for research are vital in the development of new surgical techniques, medications, technologies, and physician training. There is no substitute for human tissue. Many medical breakthroughs are only possible due to the availability of human tissue for research. Every cure for every disease humankind has ever encountered began with research. Countless lives— for generations to come— can benefit from research discoveries. There is no cost to the donor, their family, or their estate for the donation. All research tissue is provided by Florida Lions Eye Bank at no cost to the researcher. Florida Lions Eye Bank only provides tissue to not-for-profit entities. Florida Lions Eye Bank’s research program is funded by financial donations from our supporters. What's the process for donating eyes for research? There are some small differences between donation for transplant and donation for research, but there are many similarities. Whether a person donates their eyes for transplant or research. There is never any cost to the donor, their family, or their estate for the donation. Recovery takes place shortly after death. The procedure is quick: about 15-20 minutes from start to finish. Funeral arrangements are not delayed. The donor’s appearance is not affected by the recovery procedure; his or her family can have a viewing if they wish. The main difference between donation for transplant and donation for research is the type of eye tissue recovered. Generally, only the cornea is recovered for transplant. In contrast, the whole eye is valuable for research.